Good Morning! How are things in your neck of the woods? We had a nice sunny weekend here in PamKittyville. Saturday we headed out to see Frankie and joined the throngs of people heading to the coast on California Highway 17. As soon as the weather really gets nice we will need to parachute in the traffic will be so bad. We had a fun afternoon with her. 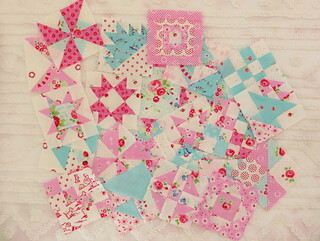 Even though we went out and about, I still had time to finish up the last of my blocks for the Scrapbasket Sampler. It has been fun to work on them, kind of like a low pressure refresher course in piecing. I like that she uses the traditional methods of piecing with triangles and I had great results going old skool. Not perfect by any means, but much better maybe than normal. Here they all are, 24 little 4 inch blocks. 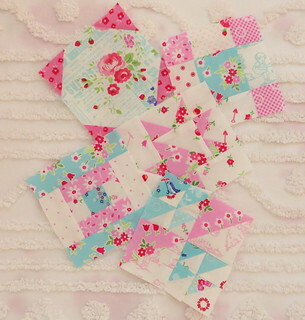 I only used what was in my basket of fabric scraps, and kept it predominantly aqua and pink. Super fun. I'm looking forward to the next steps. Coffee break reading time.. Sunday morning I took some time to relax with some inspirational reading. This is Sarah Fielke's Old Quilts New Life. I loved this quilt from the very first snippets of it that appeared on Instagram. Still my favorite. 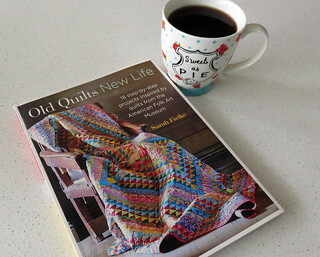 I have had this book since it came out, but I still love to open it and wonder at all the quilts. Sarah chose nine quilts from the American Folk Art Museum and created two designs based on each quilt, one a traditional interpretation, and one with a modern look. There's so much to learn about design and color by studying her work. 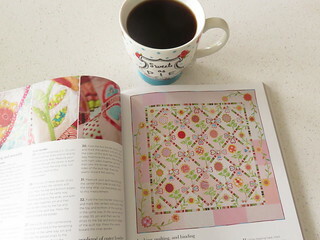 And you might remember I was a lucky swapper in the Little Quilts Blog tour swap and Sarah made my quilt. You can see it here. I love the book and highly recommend it. Thank you Sarah for including me in your list of bloggers at the end of this book. Well I can skip Hwy 17 for today but will be headed to Happy Hollow Zoo. The kids never get tired of it! No sewing for me for a couple of weeks less I get my act together between trips and pack some hexies too. Hope you have a great week Pam.